Hawker Hurricane is likely to head to the Gold Coast Magic Millions Classic after a win at Ballarat. Mike Moroney-trained Hawker Hurricane has pressed his claims for the rich Magic Millions Classic at the Gold Coast with a strong win on debut in the Magic Millions 2YO Clockwise Classic at Ballarat. 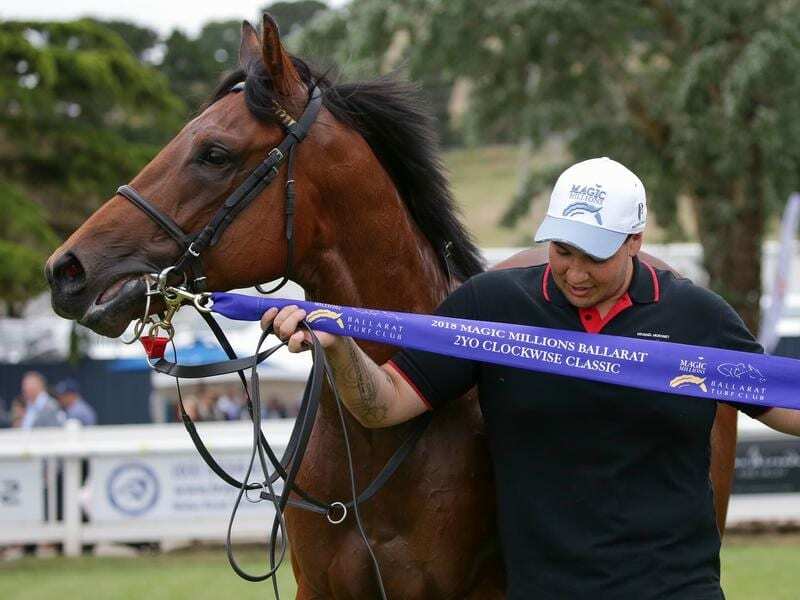 Hawker Hurricane ($6.50) was one of eight juveniles debuting in the nine-horse field in Saturday’s 1000m race and made an immediate impression, finishing well to win the $200,000 event by three-quarters of a length. The Trent Busuttin and Natalie Young-trained filly Charvet ($9) grabbed second, a head in front of Hawker Hurricane’s stablemate Alburq ($31) who lead into the final 50m before being overhauled. Moroney’s assistant trainer Jack Turnbull indicated Hawker Hurricane and Alburq would likely press on towards January’s $2 million Magic Millions (1200m) at the Gold Coast should they come through the race well. “If they keep going the right way we’ll head north,” Turnbull said. Jockey Mark Zahra was impressed by the colt who settled sixth and was on the inside of runners turning for home before getting a split at the right time. “He’s a nice horse and will improve a lot,” Zahra said. “He doesn’t know what he’s doing yet. “He’s going to be a really nice horse in the autumn. “I liked him in his jump-out and I just needed a bit of luck today and he got it in the finish. Hawker Hurricane is by first-season sire Deep Field and was a $150,000 yearling. Busuttin believes there is plenty of upside to runner-up Charvet. “She’s going to be a lovely filly next spring. She’s got Thousand Guineas written all over her,” Busuttin said.